Iranians worried about their loved ones detained in the protests that followed the presidential election got the ear of a former president, who wants the detainees released, an Iranian reformist party newspaper reported on Thursday. Former reformist President Mohammad Khatami met with families of some of the people detained and said that if the courts uphold the civil rights of the detainees, the court would order them freed, reported presidential candidate Mehdi Karrubi’s party newspaper. 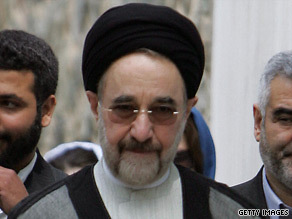 Spouses of detainees told Khatami they wanted their spouses released and that they worried about their physical and mental health, the paper reported. The government crackdown on protests came after a hotly contested June 12 election. Thousands flooded the streets of Tehran for weeks after incumbent Mahmoud Ahmadinejad was declared the winner by a margin of about 2-to-1 over his nearest rival, Mir Hossein Moussavi, who said the results were rigged. At least 17 people were killed in the demonstrations, officials said, with some reports suggesting the number could be much higher. The names of 44 prisoners were announced in the reformist paper, which included Mohammad Ali Abtahi, a former vice president, and seven journalists. Families of the imprisoned plan to later meet with another former president, Ali Akbar Hashemi Rafsanjani. Rafsanjani, a key cleric, is chairman of Iran’s Assembly of Experts, which is responsible for appointing or removing the supreme leader, Ayatollah Ali Khamenei. Rafsanjani’s daughter was briefly detained in the chaos that followed the elections.